When a trailer conversion is not enough, the full Skoolie experience is the natural way forward. At least, that was the case for Ashley and Brandon Trebitowski. 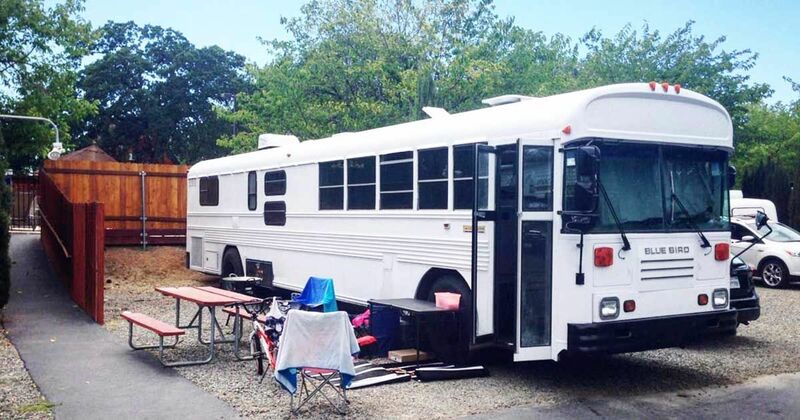 This adventurous couple from Albuquerque, New Mexico, felt compelled to follow in the footsteps of some like-minded friends and pursue a bus conversion of their own. Before long, they were eyeing up a 1999 Bluebird from Texas that would eventually be transformed into their ideal home. With dedication and a whole lot of steadfast disposition by their side, it's no wonder that this family's dream of a converted bus smoothly fell into place. Now, it's our turn to be inspired by their feat and take in a bit of their wisdom ourselves. Yellow? No more. This bus makes a shining appearance with a slick coat of white paint. As one expects in a complete Skoolie conversion, this sustainable jewel comprises just the right amount of sustainability. Perfectly placed for a picturesque vacation, don't you think? Speaking of idyllic views, how cool are these interiors? A nice juxtaposition of light and dark hues elegantly line the open-plan living area and kitchen. Large windows add a bit of sparkle to the polished kitchen counters. Whatever is on the family's mind during their "Trebventures" can be expressed on this crafty motivation board. Shelving space directly above the fridge is a nice touch to this efficient corner. As you can probably tell, a bit of creativity was definitely called for here as the Trebitowskis home-school their children. The bathroom wins the award for most efficient fittings. It is cozy and complete, ticking all the right tiny living boxes. There's even room for a mirror, right above that adorable little faucet. Here are the kids' beds. If you're getting a sense of deja vu with those arrows, it's because you would've seen the same pattern on the doormat by the entrance. Gotta love the commitment to familiar decorative themes! And it doesn't stop there: The same color schemes and country western inspired details make a special appearance in the master bedroom. In saying that, the spacious bed, with cushions and pillows aplenty, is this area's shining star.